You must be here from the lovely Rubeena Ianigro's blog. The first one features the Handpicked Bouquet Stamp Set. This was heat embossed with Antique Gold Embossing Powder. I coloured this with Watercolour Brush markers: Spring Garden. For the card front, I used Evening Gray Watercolour Brush Marker and tons of black paint splatters. Next up is the World Map Stamp Set. I heat embossed this with Pure White Embossing Powder. Next, I used watercolour brush markers to make my rainbow background. I also added a bit of black and white stripes panel for interest. I will be picking out a winner for $30 gift certificate to the Altenew store from the comments left on this post. Winner will be announced on 11/18. Now hop on to Olga Moss's blog. She is so so awesome! You are definitely in for a treat! Beautiful cards! I love the way you used the world map set. The rainbow effect is gorgeous! Beautiful cards - I love seeing the example of the world stamp - it is very appealing. I love the floral card - that is a lovely splashy, artistic card, and I love the bold sentiment. Gorgeous cards, as always! I love the watercolored florals - so stunning! Erum, I love the card you made using the Handpicked bouquet. You've got such talent & it's always a treat to see what you create. Thanks! Beautiful cards. Great bright colors and backgrounds. Love it! Thank you for sharing and the inspiration! Beautiful vibrant cards from Erum. You never disappoint. Love your work. It’s always so inspirational. Thank you. Oh my goodness, your work is ALWAYS so beautiful! Lovely cards and your colors and just inviting. Will try your techniques. Nice job so many different ideas. Thanks for sharing your inspiring ideas. Black stripe of washi tape really added a lot to the look! Gorgeous cards. Thanks for all the inspirations. Super Fabulous colorful cards!!! LOVE!!!!! I love this Altenew release and your bright color choices. These cards are just stunning!! Love this new release and these new colors of inks!!! Love your bright colours. Brilliant to emboss the world map! Love them both. the bouquet is stunning no matter which direction it sits! 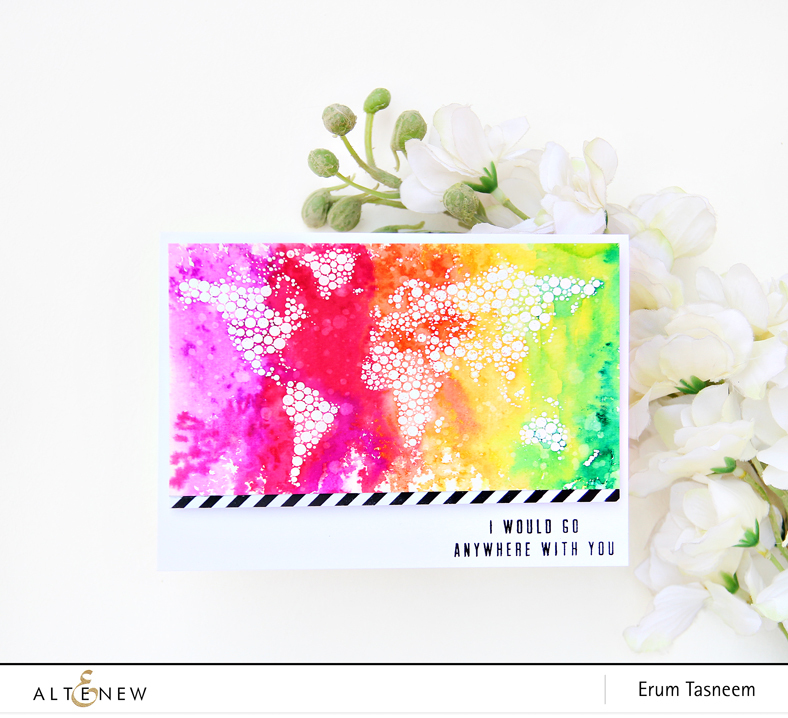 I would go anywhere with you card.... so fab! I would love to give that one to my hubby. Thanks for inspiring! Beautiful coloring on both cards. Gorgeous!! Love you designs E.T.! They are so colorful and cheerfulthey put a smile on my face! Thanks for the inspiration and for all you share! Beautiful cards, great release! I especially love your lovely floral card! Your cards are always so bright and vivid. These are absolutely gorgeous. I love bright colors, they make me feel good inside. When I see your flowers, I smile every time!! Love your cards. You are so good with watercolor. Your form of coloring is so unique. Your cards just POP off the page. Lovin’ your bright, colorful projects! The bold colours in these designs are just beautiful! Beautiful cards, gorgeous colors, amazing release. Awesome cards!! Thanks for the inspirations. Yummy! I'm glad I've already ordered this set! Your cards are beautiful. Great colors! Your cards are so pretty! Love this new release!! Love the release, love your samples! That World Map card.... LOVE IT!! That map looks so cool! I love the dots :D. I also adore the watercolor that you did on the flower on the first card. oooh how pretty!! Love the melding of colors and spatters on your cards! Beautiful cards. Your first card is really gorgeous !! What beautiful cards! I really love the first - that strip of gold glitter along the bottom of the sentiment is perfect. Such beautiful cards! I love the bright colors you used and the unique way you used the map stamp. Thanks for sharing. Altenew makes such beautiful stamps but the new inks are truly spot on and something you could really use in the craft rooms. Your cards are really colored beautifully thank you. Stunning rainbow colors!I love how vivid they are! Beautiful cards! This is one of the best releases ever. Your cards are wonderful. I love the Handpicked Bouquet. Love the look of your watercolor background! These are gorgeous cards. You just do such amazing things with watercolors! Thank you for the inspiration! Beautiful cards. Love the first one with the gorgeous flower. Fantastic cards! I love the world map card! 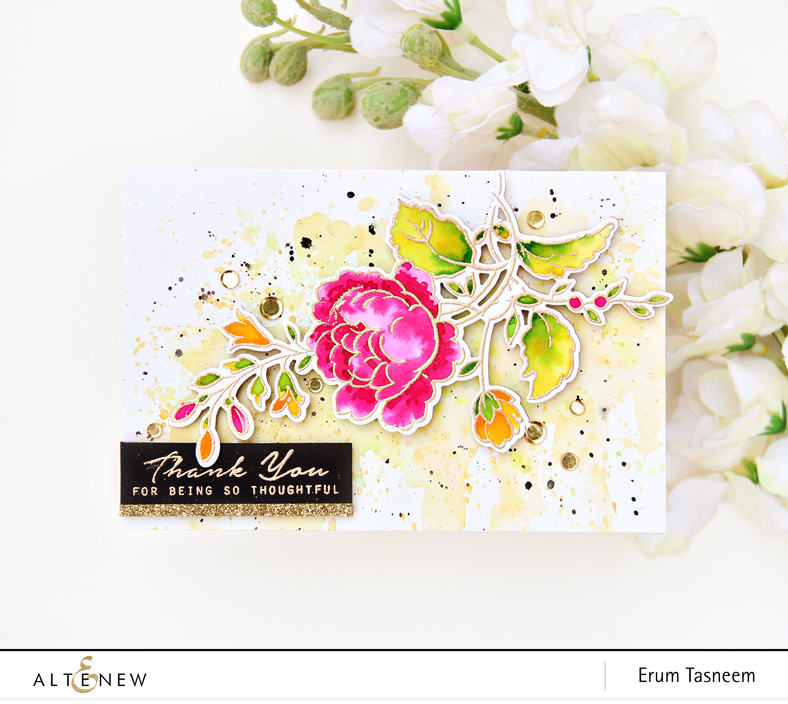 As always stunning cards Erum.You always create such magic with Altenew products !!! Just too gorgeous for words. Oh these are so sweet and fun! Love your cards. Pretty flowers and vibrant colours. The world map card is such fun. Stunning and fabulously vibrant cards! Gorgeous! Your cards are fabulous. I loved the floral card and the soft pastels you used for the flower. I'm glad you used the other stamp set so that we could see how to use it. I thought it might be nice on a travel scrapbook layout. Thanks for the inspiration. Wow! Stunning cards! I am completely awed by your colouring skills! Your cards are beautiful, I especially love the Handpicked Bouquet Stamp Set. Such lovely colors! TFS! 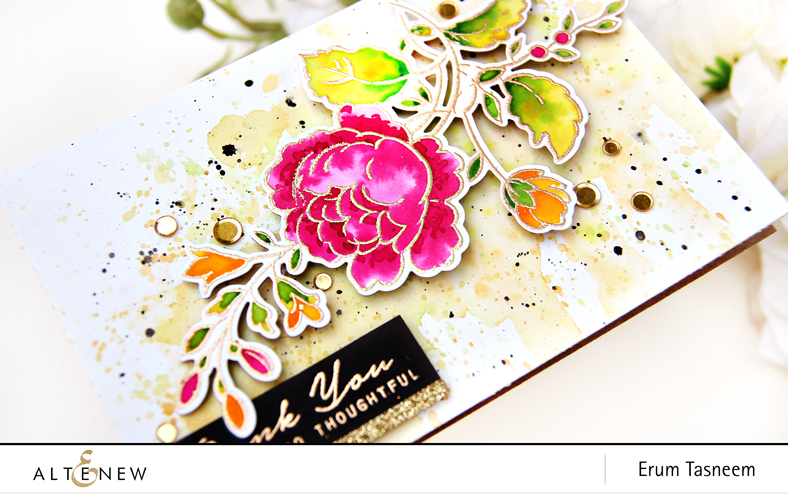 Love your use of embossing and watercolor! I love how you used the watercolors! I'm a true fan of gold heat embossing and watercolors. So pretty! Beautiful cards!!! I so love this new Altenew Release. Thank you so much for sharing. Love both cards but especially your rainbow coloring of the World View. Thanks for sharing your creativity. I am in love with your first card! I can't way to try your techniques! You are very talented! Love when you create cards in rainbow. Vibrant and unique.. both cards are so amazing . love the gold embossing!!! and that world map stamp! love it! Your card is just so beautiful!!! Love the Handpicked Bouquet Stamp Set. Thanks for creating samples for us! Handpicked bouquet Stamp is really pretty. Great use on the card you made. Very pretty. Gorgeous work. The blended colors are amazing! Beautiful cards!! I love your watercoloring on the Handpicked Bouquet card! I really love the bubbly map, but that first card is just fantastic! Love the background and how bright and luminous the florals are! I love your cards. The rainbow card is just so fun and is so cute with the sentiment. I really like the background you created on your first card. Stunning stamp sets and cards! Fabulous products in the new release. Your cards are lovely. The watercolor effects are beautiful. Erum, I love how bright, colorful, and cheerful your cards are. I especially like the way you embossed the World Map Stamp in white and then did the rainbow coloring. Great job! You just can't go wrong with rainbow emboss resist! That looks so fabulous, and the black and white stripe was a great addition. The handpicked bouquet stamp set is also amazing. I really like how the die cuts out so many little details. Thanks so much for sharing with us! 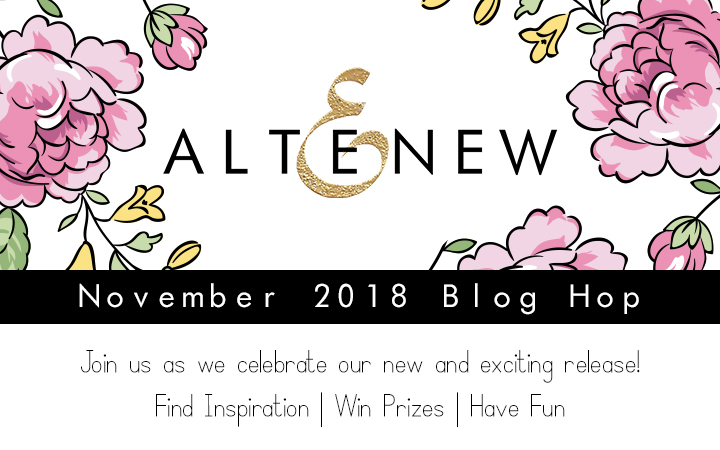 Love this new Altenew release! The handpicked bouquet stamp set is stunning. Love these cards, especially the watercoloring of the first one. 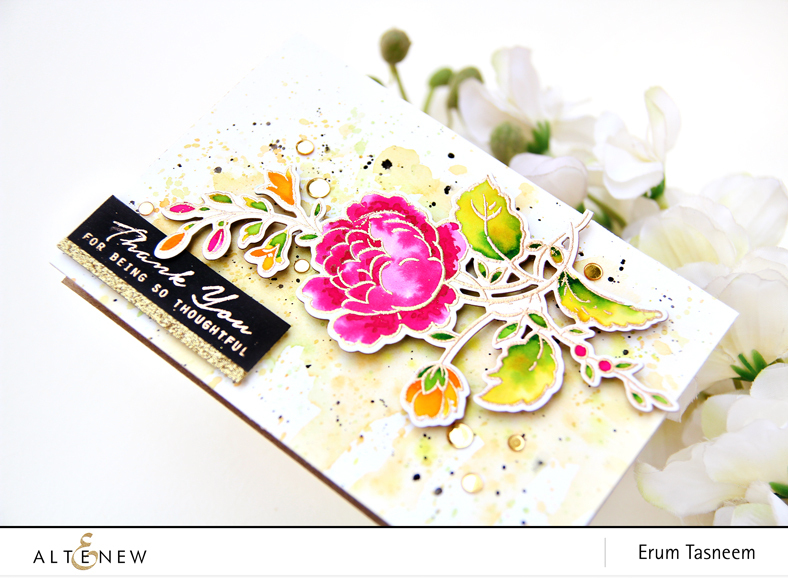 Gorgeous cards Erum! 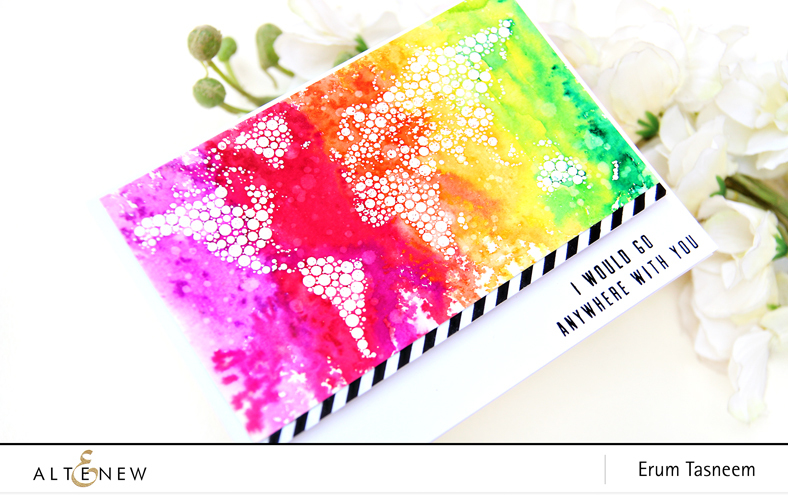 Your first card is so beautiful, your watercoloring looks amazing and I love the background you created! Your cards are beautiful! I love all the colors you used and your coloring technique! I love both of your cards, especially the one made with the Handpicked Bouquet Stamp Set. Your coloring on this is just gorgeous! Wonderful colors on both cards. I love your cards! Love how you used watercoloring and the black splatters! So vibrant, fun and colorful! Gorgeous Hand picked bouquet card, amazing water coloring and love the world map card with the black/white stripe. 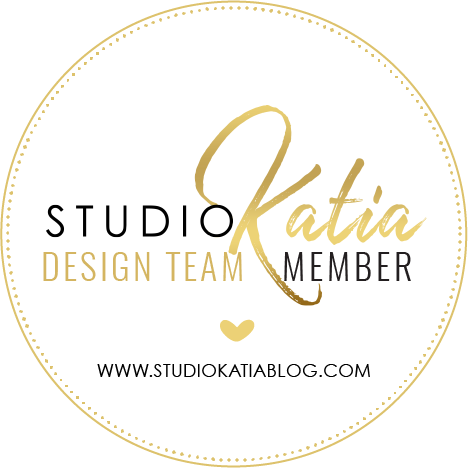 I love all the beautiful things that you have created from this wonderful collection! Such a wonderful source of inspiration. Thank you. What a beautiful card!! Love you choice of colors. Think you may have had it mentioned to you by my comment turn but wow these are stunning Erum. So delicate & elegant n style & colours.Thank you for being on this hop. Heat embossing sure does add a powerful presentation to this stamp set. What a fabulous release! I absolutely love the engraved flowers and handpicked bouquet stamp sets & the leaf medallion die! Your cards are beautiful as always! Gorgeous cards! Love the floral design and the map! Awesome release! Beautiful cards. The world map card is so unique.